for Ron Springs. The Ohio State football great is in a coma in a Dallas hospital and it's said that his condition is grave. Mark's sermon makes it [discipleship] sound so easy. He makes only passing reference to Bonhoeffer's own martyrdom - talk about "flushing our lives of all that distracts us from following Christ," and yet, that is precisely the level of committment discipleship to Christ demands of us. While it wasn't my intent to cheapen the costliness of discipleship, I fear that the effect of my message to some extent, may have been to do that. Disciples are called to daily crucifixion of their sinful selves, putting God's preferences over our own, dying to sin so that God can fill us with the power to truly live as human beings. As Bonhoeffer pointed out in his classic, The Cost of Discipleship, God's grace, the undeserved gift of forgiveness and life through Jesus Christ, is free. But to receive it, we must empty ourselves, so to speak, of ourselves. No doubt because Ohio State's football teams frequently vie for conference and national championships, Buckeye fans are accustomed to seeing our favorites' achievements denigrated. This year, a team which most of us who love the Bucks thought didn't deserve high ranking in the pre-season polls, is being put down by some for having played a weak schedule. The implication is that the Buckeyes don't deserve to be ranked number one right now. To some extent, that criticism of the Ohio State schedule is valid. Complaints from other Ohio state-supported universities that they should get first-shot at Ohio Stadium gate revenues has resulted in $350,000 pay days for schools like Kent State and the University of Akron. But those dates haven't made the Buckeyes more credible to the average college football fan around the country. On top of that, fewer people have seen the 2007 Buckeyes' dominant defense or its wide-open offense than saw the shellacking administered to last year's squad its BCS Championship Game against Florida's Gators. Although Ohio State's 7-0 record includes convincing victories over Washington and Purdue, both then ranked, at home, OSU hasn't had as tough a schedule so far as South Florida, Kentucky, or Cincinnati. That changes today, as the Buckeyes enter what will be the toughest part of their 2007 campaign. Michigan State, though still inconsistent, is a talented football, with the kind of great defense you'd expect from a Mark Dantonio-coached team. And the rest of the schedule will only get tougher. Next week, the Buckeyes go to Penn State for a night game. That last sentence will send chills down the spines of Ohio State fans, remembering how, not so long ago, an OSU team with hopes for a national championship were clobbered at Penn State in a night game. Although Paterno's 2007 team has suffered from its own inconsistencies in 2007, this is a terrific team. As usual, on the final game of the season, the Buckeyes travel to Ann Arbor for a showdown with the Team from Up North. Don't be lulled into underestimating the Wolverines because of their opening losses to Appalachian State and Oregon. Those are both good teams, for one thing. And for another, Michigan is a much-improved team, with some impressive wins to their credit since those humiliations. Starting today then, Ohio State will begin to answer some of the questions football fans have about them. If they win all five, a tall order, there will be no doubt that they deserve to play in the national championship game. Even if they lose one--depending on when and to whom the loss comes, they may still be in the hunt. But as a Buckeye fan, I have to say again what I've said several times before: The fact that we can even speak of Ohio State as number one this year or talk about the team playing for the national title is incredible! I never would have expected it. This was, as I've also said before, supposed to be a rebuilding year in Columbus. The fact that it's become more than that is tribute not only to the talent of this team and their dedication and to Jim Tressel's skill as a recruiter, but also to his skill as a coach, both between games and during games. See ESPN's article on Ohio State's challenge in what has become the year of the upset. Hello, Goodybe: Whatever Will I Wear? 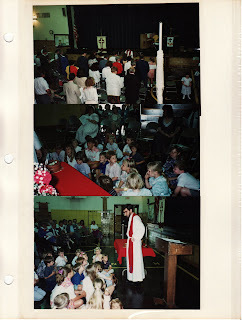 As you can see, in these snapshots from my younger, thinner, and bearded days, I was wearing what has become standard attire for Lutheran clergy leading worship. Seeing them led one Friendship member to ask when, exactly, I stopped wearing this attire during worship at Friendship and whether I would resume doing so at Saint Matthew. The short answers to those two questions are: Early in Friendship's life and yes. But the questions might warrant a lengthier examination, beginning with describing just what "standard attire for Lutheran clergy leading worship" is and what it's all about. Tomorrow, hopefully, I'll talk about why I stopped wearing this attire over the past seventeen years and why I'll take it back up again once I'm in Logan. A white robe, which is called an alb, from the Latin alba, for white. What my one-time seminary advisor, the eminent theologian Hans Schwarz, called the rope, tied around my middle, is called a cincture. A red cloth draped over my shoulders, an example of what's called a stole. Beneath those articles of clothing, I was also wearing what's called a clerical collar for my dress shirt. In seminary worship classes, we were taught the meaning of each of these pieces of clothing. The alb is meant, broadly, to represent the purity of God. In ancient times, clergy went clothe-less beneath these garments, an apparent repudiation of their reliance on anything but God. They may also have had in mind Saint Paul's call for Christians to "put on the Lord Jesus Christ, and [to] make no provision for the flesh, to gratify its desires" (Romans 13:14). These ancient clergy also wore the alb shoeless. I don't know anyone who follows these precedents today. It wouldn't be such a hot idea. After all, we clergy have enough reputation problems these days; we don't need to add to them by going around in our altogethers under our albs! The alb may also allude to the vision of believers in heaven given by the risen and ascended Jesus to John. John wrote down this vision in the book of Revelation. You can see that here. The problem with that symbolism is that all who have followed Jesus are in white in John's vision, not just those who've filled the pastoral or priestly roles. The cincture, according to some sources has only a practical use: keeping flowing robes from tripping up clergy. But I seem to recall some more pious purpose attributed to it, though I can't recall what it was. But, of course, this call is issued not just to clergy, but to all who believe in Jesus Christ. Stoles are usually colored according to the season of the Church Year or, as in the case of the pictures of me above, according to the particular occasion. Friendship happened to begin its life on Pentecost Sunday, when the assigned color is red. Stoles can be multicolored, though, and often, as is the case of the one pictured to the left, they're adorned with various symbols of the faith or with the season with which they're associated. The stoles I own were woven by a nun who was a fine artist, a participant in the Greater Columbus Arts Council's Artists in the Schools program, which my wife administered in the early-1980s. Ask most clergy who wear clerical collars and they'll tell you that they symbolize their office. The shirts, they'll say, are signs of Christ and the Church having set them apart to fulfill a certain function. Years ago, I was angered by a pastor's wife who told me why her husband routinely wore his clergy collar. "Restaurants always let us get tables quickly when Bob wears his shirt," she told me, giggling. But this is the opposite of what the collar is meant to represent in today's Church. Clergy aren't supposed to be privileged characters, only Christians who fill a particular function. The office of pastor is a calling and a privilege. But its function is to be a servant of the servants, someone who encourages and helps others in the Church to do all that God has called His people to do. If Jesus bent down to clean the filthy feet of His disciples, who am I to use Jesus and my office in His Church as a pretext for getting faster service at a restaurant? Jesus promises all believers that "the last will be first, and the first will be last" anyway. So, there's no need for pushing ahead. We're called to a different way of life! The story behind the widespread adoption of the clerical collar as the uniform of pastors and priests is pretty humdrum. It was only after the fact of its use that the explanations mentioned above came to be used. When much of the Christian Church came to be centered in Rome, the Roman (Catholic) Church adopted the organizational scheme of the Roman Empire. Since the Bible never outlines a specific mode of organization, the bishop at Rome had to adopt some way of organizing and administering the far-flung church and adopting the system of an empire that had been so successful for so long made sense. The uniform of the local bureaucrats for Rome's empire was the clerical collar. They were clerical workers. So, as the local administrators of Word and Sacrament, parish priests began wearing the same attire. When the Roman Empire died, the bureaucrats disappeared. But by that time, their uniform had been adopted by the priests. This is one more example of how through the centuries, the Church has adopted and adapted customs and even holidays already extant in their cultures and "Christianized" them. Some people point to the recasting of the Roman holiday of Saturnalia as Christmas as though it somehow takes away from Christmas or the celebration of Christ's birth. No, it was a convenient leap from celebrating a holiday about light to remembering the light of the world who came into our lives in Jesus Christ. Soon: Why I stopped wearing this attire at Friendship and why I will resume doing so at Saint Matthew. When Susie asked me to say a few words about my Aunt Betty, she told me that what she had in mind wasn’t a sermon. A sermon, of course, proclaims the Good News that all who believe in Jesus Christ will live with God forever. We all need to hear that Good News--that Gospel--today. It’s the only thing that can give us hope for the future and the power to live today. And I’m looking forward to the Pastor bringing that wonderful message to us this morning! But Susie was right. A eulogy is appropriate today. Yet, I've got to admit that since talking with Susie, I’ve wondered what I should say. I’m accustomed to giving sermons; but I’ve never delivered a eulogy before. As I considered what I would say though, I thought about that word, eulogy. It’s a compound word, literally meaning good word. In eulogies, we say good words about loved ones or friends who have passed from this life. We recount life lessons we’ve learned from them. We tell of our happy memories of them. To tell you the truth, most of my happy memories of my Aunt Betty also involve my Uncle Carl. From the moment that another member of the extended family, my uncle’s first cousin Mary Ranck, introduced Carl to Betty, when they were just teenagers, they were inseparable. And even after Uncle Carl died four years ago, the bond of their love remained unbreakable. During a memorable visit I had with Aunt Betty down in Cincinnati, she not only spoke of my uncle with obvious affection, but told me how much she looked forward to being with him again in heaven. Anyone who observed the two of them together knew how much they loved one another. They didn’t send each other love poetry. Nor was their love such that they never disagreed or got on one another’s nerves. I remember, for example, when we helped Carl, Betty, Susie, and Jack move to the place in Springfield, we’d made several runs between here and there and everybody was tired. No one more so than Carl who, with everyone in the car asleep but him and me, began to whistle to keep himself awake. (I used to love to listen to Carl whistle and sing!) He’d been warbling awhile, when Betty said, “Carl, be quiet!” He realized she was right and rolled the window down to let the air wake him up. Later, I heard the two of them laugh about this incident. The picture I got of their marriage, both when I was a boy and when I grew to be a man, was of a couple who were rowing in the same direction. And they did that their entire married life! I guess I’d better watch out or this eulogy may turn into a sermon. So, there’s one other thing I want to mention about my aunt. And that’s her laughter. For as long as I live, I’ll never forget her laugh. It was one of those deep and ready laughs that too many people give up when they hit a certain age, as though there were something immature about enjoying life. In spite of her battles with the pains and heartaches of life, Betty rarely seemed to have that problem. My cousin Jack and I sort of grew up together, since we’re only four months apart in age. I often stayed for extended visits with him when the family lived first in Oakwood and then, in Carol Stream. I think that Betty took particular delight in Jack’s and my antics, whether we were pretending to be teen musical sensations...we called ourselves the Bedd Buggs, pretending to have a radio station, or presenting the evening TV news and weather at her dining room table. We incited loud laughter from Betty. But her laughter never seemed like derision, only delight. That’s the way it was with Betty: something tickled her and she let loose with that unique laugh of hers. Uncle Carl, surely a hambone, a feature that seems to have been liberally spread throughout the family tree, never had a more receptive audience than my Aunt Betty. She not only laughed when he cracked his jokes, but often asked him to repeat them for the benefit of others. It was, I suspect, her deep faith in Jesus Christ, that gave Aunt Betty such a delicious sense of humor, such an appreciation of the absurd, and such a capacity for rebounding from setbacks. Once, when I was a boy and my aunt and I were alone in her kitchen, she told me about her faith and how she came to believe in Jesus. She told the story without fanfare or drama. Jesus Christ was the foundation on which she built her life and all her hope. And she told the story with both gratitude and matter-of-factness. And it’s here that my eulogy almost inevitably must become a sermon. I find it impossible to speak my good words about Betty without also remembering the Good News of the Savior in Whom she believed! Today, you see, I think, Aunt Betty would want all her family and friends to know that Jesus, Who rose from the dead, is good for His Word. He was waiting for her when she passed from this life and came into His presence. And she would tell you that those happy reunions for which she so longed have taken place and are still taking place and will keep taking place eternally. Not only is she with the Lord, she’s also with Carl and with Gary and all her other loved ones who died believing in Jesus. And then she would laugh. We can too. This may have sounded like a sermon. That’s because in sermons, ordinary, imperfect people tell the Good News of Jesus to others. This has been a eulogy, but if it sounds like something more than that the reason is simple: Aunt Betty’s life was a sermon. Twelve days ago, I listened to some of Talk of the Nation's interview with Chris Matthews. Matthews told two interesting and evocative stories from his days as an aide to Democratic Speaker of the House Tip O'Neill. 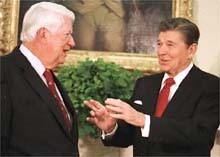 Both involved O'Neill and Republican President Ronald Reagan, two men with markedly different political philosophies and differing visions for the country. The first of Matthews' stories took place in Reagan's hospital room in March, 1981, shortly after the President had been shot. On entering, O'Neill leaned over Reagan's bed and kissed him. Then, holding hands, with O'Neill on his knees, they recited Psalm 23 together: "The Lord is my shepherd, I shall not want. He makes me lie down in green pastures; he leads me beside still waters; he restores my soul. He leads me in right paths for his name’s sake. Even though I walk through the darkest valley, I fear no evil; for you are with me; your rod and your staff— they comfort me..."
The second is a personal memory of Matthews from those days. Reagan entered the anteroom of the Speaker's office, a place occupied by Matthews himself, just before the President was to deliver a State of the Union message. "Mr. President," Matthews said, "this is the room where we plot against you." "Oh, no," Reagan replied impishly, "the Speaker says that we're friends after 6:00." I wonder how some of today's Red or Blue ideologues would react to such bonhommie between two political rivals, one an unabashedly liberal Democrat, the other considered to be the godfather of today's conservative Republicans? How would they feel about the fact that after hard-fought battles, the Republican President and the Democratic Speaker could have a belt together? And how would it strike them that, even these people indisputably committed to their own parties and philosophies, found ways to compromise and make government work? How, in short, do the ideologues of the Left and of the Right react to civility, even friendliness, among rival politicians? When I read the blogs or listen to the comments of today's fierce ideologues, I think that they look askance at any camaraderie or compromise in politics. They'd rather win an argument, at least in their own eyes, than advance the interests of the country at large. (Or even their own causes, if incrementally and incompletely.) And they have no patience for the simple practical fact that politics, like much of life, is about people working together with people, sometimes people who have deep disagreements. Here were sworn enemies, the leaders who beat the ____ out of each other all day in public, but the minute those doors closed for the state dinner, the daggers went away and it was one big happy family. I saw former Republican Sen. Bill Frist weaving through the tables, and he came over to Ted Kennedy and start [sic] massaging his shoulders and laughing like they were the oldest buddies in the world. Everybody was crossing the aisles and chuckling, and I said, "Oh, I get it! It really is just a game." Redford is one of my favorite actors. He hasn't, in my view, always gotten a fair shake for his talents, with critics often overlooking the subtlety of his performances. I also admire him as a director. And there is reason to doubt the genuineness of what political figures claim they believe when the cameras are turned on. I think of the virulently anti-gay Senator Larry Craig found soliciting a homosexual tryst in an airport restroom. Much of our politics is a game, a kabuki dance of parroted talking points in which the parrots don't really believe. Members of Congress and other public officials are sworn to do what's best for the country. It's disappointing how infrequently they do that, to be sure. But surely the solution to that problem isn't for members of competing political parties to wall themselves off from one another, sworn enemies. According to most people who've spent decades in Washington, there's been too much of that partisan walling-off in recent years anyway. Okay, you think, it's only Robert Redford's opinion that pols of different persuasions shouldn't be friendly to one another. Not everybody feels that way, right? Wrong. Today, I see that uber-blogger Arianna Huffington is proudly publicizing her interview with current Democratic Speaker of the House Nancy Pelosi. Huffington isn't touting Pelosi's words, but her confrontational question of the Speaker, "Are you too well-behaved to get us out of Iraq?" Of course, the answer to anybody familiar with the Constitution, is that, frustrating as it may be for many in the country, Pelosi's inability to shut down the war has nothing to do with her being polite. It has everything to do with the fact that neither she or Senate Majority Leader Harry Reid have majorities able to override vetoes President Bush would smack against any measures the Congress passed for ending the war. But to ideologues of the Right and the Left, it seems, the niceties of the Constitution are only to be heeded when doing so advances their preferred political decisions. I also admire the Constitution. There are frustrations that go with democratic-republican government. But lose civility or lose the Constitution and we lose America. Reagan and O'Neill knew that. I wish that today's firebrand partisans knew it too. 1It should be pointed out that Thomas Jefferson, father of nasty partisanship in US politics, wasn't among the Framers at the Constitutional Convention. In fact, he initially opposed the Constitution, disliking power going to a central government and looking askance at the establishment of an executive, the President. But, ideologue and hypocrite as he always was, when Jefferson became President, he claimed authority never granted to the chief executive by the Constitution and openly told his friends that sometimes, a leader had to break the rules in order to get things done. Jefferson would be supportive of today's virulent ideologues, be they conservative or liberal. But I think that George Washington is a far better model for us today than Jefferson. Washington adhered to strong principles and he set this country on a positive course from which we benefit today. But, in spite of a fierce temper, he was civil. The story’s told of a man who went to see a psychiatrist for the first time. “Why are you here?” the doctor asked him. “For the past six months, I can’t seem to stop worrying,” he explained. “What’s been going on in your life?” the doctor wonderd. “I lost my old job, then started a new one and two weeks later, I got a new boss. My son is addicted to the Home Shopping Network and just ran up $15,000 of debt on my charge card. My daughter came home from school the other day, announcing that she had to write an essay on her greatest hero and asked me, “Who should I write about, Dad: Lindsay Lohan or Osama bin Laden?” The doctor listened to all of this and told the man that the explanation for his worrying was simple: He had a lot of worries! Over the past few weeks, we’ve been talking about overcoming worry. We’ve said that to overcome worry, we need to place ourselves in the hands of God. Last week, we considered four steps for overcoming worry that came from Psalm 104. But the fact is that worries do come our way in life. Today, I want to hold up four key affirmations and four accompanying action steps that we can use when faced with worrying times. They’re based on one section of Psalm 145. Affirmation #1 is found in verse 13. “The Lord is faithful in all his words, and gracious in all his deeds.” When you and I face worrying times, it’s important to remember that God is faithful. A number of years ago, Lutheran pastor Walt Kallestad told the story of Phoenix builder Gary Gietz. Gietz formed his own company, dreaming of providing customers with beautifully-crafted homes, reasonably priced and readied for occupancy in a timely manner. But fifteen years later, he had wandered far from his dreams. He excused shoddy business practices, telling himself that delays and poor workmanship afflicted the building business. His whole life was composed of worrying about and striving to keep subcontractors, vendors, and customers just happy enough to move onto the next job and stay in business. But then, Gietz decided to approach things differently. He asked himself a piercing question about his approach to business: What is it that God wants me to do? That question, a prayer really, caused him to gather twenty-one key people at a local restaurant. They brainstormed together about “how it would be to have freedom from the tyranny of reneging on promises, the freedom to keep their word and be on time...” What Gietz and others are learning and teaching is that when we make our supreme concern not pleasing others and not merely getting by, but living and working for God, worries recede. Sometimes, we may become more successful when we do this, though we could be less so. There are no guarantees along those lines. But either way, we can rely on God because God is faithful. And the action step that flows from that affirmation is simply this: When worries come, seek God. Lay your worries before God. God makes a way through and beyond our worries. The next affirmation is drawn from the next verse of Psalm 145. “The Lord upholds all who are falling, and raises up all who are bowed down.” The affirmation here is: God raises those laid low by life! When worries come our way, it’s easy to give in to despair. It’s even understandable. But it needn’t happen! At that moment, Corrie looked down to see an ant. She noticed that the moment the ant felt water on the floor, it went straight back into its hole in the wall. Corrie realized that when the ant confronted something too big or overwhelming, it went to its hiding place. “Corrie,” God seemed to tell her, “don’t look at your weak faith...I am your hiding place, and you can come running to Me” the way that ant went to its hiding place. It was then that Corrie remembered Jesus’ words, “Come to Me, all you who are weary and burdened, and I will give you rest.” God raises those laid low by life. That’s the affirmation. And the action step that goes with it is this: Dare to hope. Dare to act on the belief that whether here or in eternity, God will lift you up and be with you always! Our third affirmation comes from the next verse of Psalm 145: “The eyes of all look to you, and you give them their food in due season.” Here’s the affirmation: God helps those who turn to Him. Beth Slevcove is a pastor who works with Youth Specialties. When she went to get that tattoo and to lovingly confront her neighbors for their bullying, she had no guarantees that things would turn out as they did. The God we know in Jesus Christ doesn’t promise us easy, propserous earthly lives. Just ask Christians who endure poverty, persecution, or other afflictions. But God does promise to help those who turn to Him and to be for them. That’s the affirmation in which Beth Slevcove obviously believed. And here’s the action step she exemplified: Dare to expect God to help you and be for you! The next affirmation comes from the next verse: “You open Your hand, satisfying the desire of every living thing.” The affirmation is simple: God satisfies our desires. Now, the moment I say that, an alarm bell ought to go off in our heads. That's because when I consider my desires, I have to confess--one sinful human being to others, that some of the things I desire aren’t good. They’re things that don’t glorify God or that hurt my neighbor. And some of the things I desire may be good, but just not good for me. For example, I may want to eat chocolate 24/7. But, even though chocolate isn’t a bad thing, it would be really bad for me to eat it all the time. And, it seems that there are some desires I have that God just doesn’t want me to have. No matter how much I pray about it, for example, I’ll never be as handsome as Brad Pitt, Orlando Bloom, or Denzel Washington. Those who follow Jesus are expected to channel their desires. That’s why Jesus tells us to pray, “Your will be done.” People who truly surrender to God find that their desires are, day by day, transformed. Our brains can get fogged in by a lot of selfish desires. I know that mine can be. But as we submit to God, we start to want what God wants for ourselves and for our world. Psalm 37:4 says, paraphrasing it just a bit, “[First,] Take delight in the Lord, and [then] he will give you the desires of your heart.” Put God first and God will give you the things you most need to be a fulfilled person of God. Worries come to us all. But worry doesn’t need to have the final word over our lives. God is faithful; so, seek Him in prayer. God raises those laid low by life; so dare to hope in the God we know in Jesus Christ. God helps those who turn to Him; so expect God to help and to be for you. God satisfies our desires; so ask God to transform your desires to ones that please and honor God, help your neighbor, and bring you personal fulfillment. Next week, the perfect ribbon for tying up our seventeen-plus years together: Four worry-blockers from Jesus, found in Matthew 6.